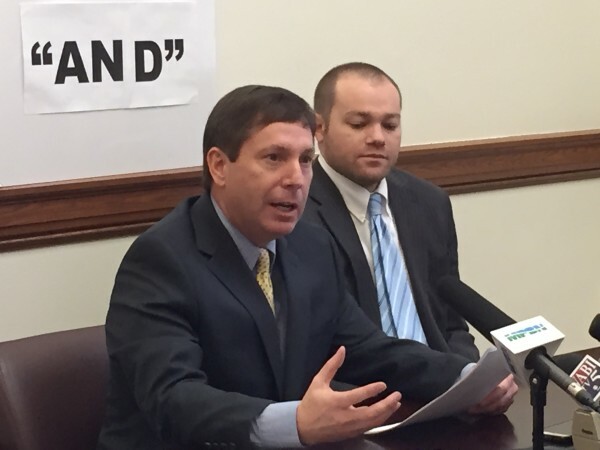 House Minority Leader Ken Fredette, R-Newport, and Patrick Woodcock, director of the Governor's Energy Office, sit in front of a sign representing the "$38 million and" omitted from the final draft of an energy bill that the Maine Legislature passed in 2013. Fredette met with the media Wednesday at the State House to share details of legislation he's proposing to address the problem. The agreement puts “and” back where legislators say it belongs in the part of a 2013 law that addresses funding for energy efficiency programs but also creates a new Cabinet-level energy commissioner and deputy commissioner, along with two other positions. Those positions would be funded by a mix of a federal grant and $300,000 from the Efficiency Maine Trust. Attaching new provisions to a bill designed to fix the typo quickly drew criticism. Other legislators from both parties rejected Fredette’s assertion that his bill is more likely to find success than a simple typo fix. Republican Rep. Larry Dunphy of Embden, a member of the Legislature’s Energy, Utilities and Technology Committee, agreed, even though as of Wednesday he was the only lawmaker who had signed on to Fredette’s bill as a co-sponsor. Dunphy said he supports most of the elements in Fredette’s bill but prefers to fix the typo by itself. Other than Dunphy, Fredette’s office did not provide the names of any other lawmakers who support Fredette’s bill. Fredette said he is confident that support will materialize. The bill also would make the executive director of Efficiency Maine a gubernatorial appointee who would be confirmed by the state Senate. Fredette said the current executive director, Michael Stoddard, would be that nominee. The Public Utilities Commission last month r uled that its interpretation of a sweeping energy bill passed in 2013, at least as far as funding for the Efficiency Maine Trust goes, is that the trust will have a funding cap that’s about $38 million lower than lawmakers intended. The difference of opinion swirls around the omission of the word “and” in one sentence, a clerical error that legislators say misrepresented their intent when passing the law. Two of the three members of the commission based their ruling on a literal interpretation of the wording, which differed from what legislators say was their intent. Fredette said during a news conference Wednesday that he suspects Democrats will balk at his proposal to expand the executive branch and by extension, the governor’s power. Assistant House Majority Leader Sara Gideon of Freeport proposed a bill last week that would have simply restored the “and,” but the bill was rejected by the Legislative Council, which is comprised of five Republicans and five Democrats who hold leadership positions. Patrick Woodcock, who directs LePage’s energy office, said Maine needs to follow other states where energy policy is a high enough priority to merit a Cabinet-level energy czar. Asked by reporters why LePage supports creating a new bureaucracy after years of trying to reduce the size of state government, Woodcock said in this case, the change is warranted. “It’s past due that we have an energy office that’s separate from the governor’s office and that we fund that position so we can improve energy policy for our state,” said Woodcock. Fredette’s bill has an emergency preamble, which means it would take effect immediately if enacted. House Speaker Mark Eves, D-North Berwick, said he supports Gideon’s simple fix. “Any other approach is bad for our businesses and families who are counting on the [Efficiency Maine] funds to lower their energy bills,” Eves said in a written statement. Senate President Mike Thibodeau, R-Winterport, also declined through his spokesman to comment on Fredette’s bill, even though he appeared at a news conference with Fredette on Monday where he said fixing the typo was an opportunity to revisit other aspects of the 2013 energy bill that lawmakers passed over LePage’s veto. Thibodeau did not appear at Wednesday’s news conference with Fredette. Katz said he is confident that enough Republican senators support the simple typo fix to enact a bill over objections from LePage or others. “I’m optimistic we’ll have enough support to get it passed and then to override a veto, if there is one,” said Katz. Sen. Dawn Hill of Cape Neddick, the lead Democrat on the Energy Committee, said the PUC first exploited the typographical error despite the clear intent the Legislature expressed when passing the law. Hill said she agrees that legislators should amend the law to add the missing “and” for clarity, but she disagreed with with Fredette’s proposal to create a new state department. Scott Thistle, state politics editor for the Sun Journal, contributed to this report. Correction: An earlier version of this report incorrectly stated that the omnibus energy bill with the missing “and” passed in 2014. It passed in 2013.